English: Go with a friend! 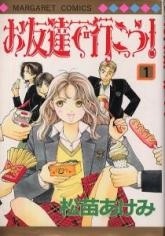 A comedy about a really short girl, Chimari, who enters a co-ed high school hoping to meet someone special. She thinks she finds the perfect guy on the first day, but he turns out to be a girl! Then she meets a guy she knew and disliked in kindergarten who is girl-crazy and always teases her.